When my older children were young, I would homeschool year round in order to keep a routine, which they thrived on. It wasn't until a few years later, when I had my third child and they were about 6 and 8 years old that I personally felt a need to change routines in order to have time to plan their homeschooling and add things to our schedule that our homeschooling routine seemed to miss. Truly believing that “Education is an atmosphere, a discipline, a life.” (Charlotte Mason), I was determined to find ways that provided for education in a way that felt like a vacation to me and to them. This is a huge part of education and life, so why not spend 3 months focusing on things that will help your children in their own adulthood? During the summer months, I focus on skills like swimming, learning more chores around the house – like laundry, cooking or mowing the lawn, how to shop for bargains at the store and at yard sales and organization to name a few. These are the things that make well rounded people and capable of learning more responsibilities, as well as provides for an easier start to our school year when my children have learned more things to help in our home and feel accomplished in learning new things. Not having books to fill our mornings, it has been helpful to have my children learn new hobbies in the summer when we have more time to help them learn how to do the basics of the hobby. My children have learned a lot of different kinds of hobbies, some lasting longer than others but all important to finding what they really like! Once they have had more time learning how to do a hobby, it allows their fall and winter months to be filled with more opportunities to fill their free afternoon time with good things. I tend to run a tight ship when it comes to what is read during the school year, although the selections are based off each individual child, however this doesn't always foster a love of books and that is my goal in my children's education. During the summer months, I require some reading but I do not have any input on what is read. This has been amazing for my children who ‘don't like to read' because they are in complete control of what they read, after they understand and respect the guidelines of appropriate reading material. 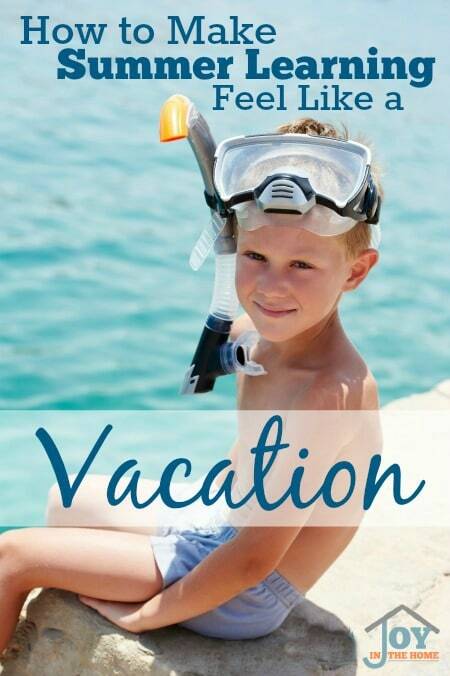 Vacations are always on family's mind in the summer, and our family is no different! We are blessed to live in a historically rich area and have a lot of opportunities for a one day vacation that would completely count as a learning field trip. Learning what is in your area can really be a great way to fit in the field trips that are so important and often neglected during the school year. Spending a portion of your summer in service to others is a great education. There are a lot of opportunities for summer services, one we like to do is for an orphanage close to our hearts, Door of Hope Palawan. Summer time is a great time to focus on credit for electives with your middle school and high school children. Get your photography loving teen to be your family photographer on your field trips and learn about photography when time isn't so crazy with out work, then turn their work into a keepsake! In the end, learning to maximize the lazy days of summer to fill your days with learning in a way that looks so different than a homeschool day will really make the most of your homeschooling year!